Nationally, support for the health care reform plan proposed by President Obama and congressional Democrats has fallen to a new low. Just 42% favor the plan while 53% are opposed. 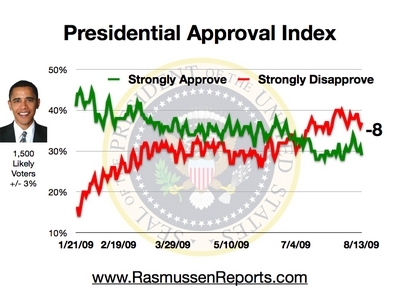 Obama's approval ratings have been tumbling lately, so I figured I'd jump in and say a few things. I haven't posted anything political or provocative for a while (I've been quite busy welding), but I have had a few things on my mind, particularly about this whole health care fiasco. Long story short... I think it's quite terrible. On the surface, this idea of universal health care seems great. I like the idea that nobody should have to worry about being able to afford health care, and that the government would cover health and medicine for the people; good health seems like a basic right, particularly when you consider that the relationship between poverty, health, and inequality. It seems that a government initiative to provide health care for everyone is to the benefit of the nation. The problem, however, is that health care is expensive, and if you remove the potential competition-driven innovations in efficiency, health care will remain expensive. Furthermore, this sort of intrusion into the market tends to involve higher taxes on the only entities capable of reducing the prices (the insurance industry, the pharmaceutical industry, etc.). When you simply increase the taxes on larger businesses, the natural tendancy of the businesses involved is to simply raise prices in order to stay afloat, which ends up raising costs for everyone that this plan is supposed to help. This is not a solution to the problem of the price of health care. An actual solution likely requires some much needed (but politically dangerous) tort-reform and some more thought around medicare/medicaid handling (also politically dangerous), as these two issues appear to be the primary causes of ever increasing health care costs. I've been waiting on the edge of my proverbial seat for you to chime in. We disagree on health care as a right, but I wholeheartedly agree with tort/medicare reform. John Mackey recently laid out a terrific 8-step plan to reducing the cost of health care -- a plan that doesn't require this massive government expansion President Obama so heavily favors. • Remove the legal obstacles that slow the creation of high-deductible health insurance plans and health savings accounts (HSAs). • Equalize the tax laws so that that employer-provided health insurance and individually owned health insurance have the same tax benefits. • Repeal all state laws which prevent insurance companies from competing across state lines. • Repeal government mandates regarding what insurance companies must cover. • Enact tort reform to end the ruinous lawsuits that force doctors to pay insurance costs of hundreds of thousands of dollars per year. • Make costs transparent so that consumers understand what health-care treatments cost. • Finally, revise tax forms to make it easier for individuals to make a voluntary, tax-deductible donation to help the millions of people who have no insurance and aren’t covered by Medicare, Medicaid or the State Children’s Health Insurance Program. It almost makes entirely too much sense to be considered in Washington. Well said. As a though, universal health care would be truly awesome. But it's cost is estimated to exceed even our countries expenditures on defense (which is not cheap). I think the gov't could subsidize the rising costs of medical insurance or better yet, severely limit or cap the litigious capability of individuals toward their doctors. It's one large reason why costs keep going up. Whoa, my bullets went bonkers. Note from the admin-bot: SPAM removed upon detection. Wow Josh! Talk about blowing me off my seat. I agree mainly with the comments of TCM, but I greatly admire your take on this issue. Spot on... I totally agree.